Unfortunately, he likes pet flies too. The fly didn’t last long. But that didn’t stop my son from looking for another pet. I explained that, in fact, I didn’t want him catching and saving flies. But the no-fly rule was harder to enforce than I thought. Because when I looked up at the fruit bowl and realized it had a big clump of tape in it–sticky-side-up–waiting for the next unsuspecting “pet” to land. And the tape wasn’t just on the bowl, either. He’d posted little fly-traps all around the kitchen–the fridge, the dishwasher, even along the edges of the counter. “Those are so when they land, I can catch them without hurting them,” he explained. VERY Cute and humane of him! I like his fly catcher/swatter…it's a neat little invention! Ha Ha! What a creative young man you have on your hands!!! How cute and sweet! Happy WW! I'd be looking for a redirect too! But this is funny! What a smart little cutie! 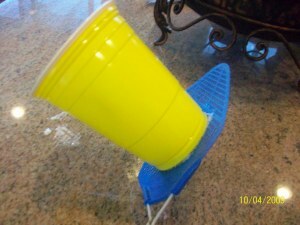 I love that he glued the cup on the swatter! That's so innovative. ♥ That cracks me up!!! My kids like to save rollie pollie bugs! They were out side all day this summer collecting them in a water bottle then wated to bring them inside! It didn't happen but man they had a ton! That is so cute- I love how his mind works! It reminds me of my 6 year old. I am always finding little inventions around the house. Mine loves our dogs, probably spends more time with them than anyone else in the family, but he still finds time to make up a ton of contraptions. but, who knows, maybe that plan will work for you. In my experience, there will also be a lot of experiments that go along with having a dog, such as – how fast can I go if I tie the dog to my bike, etc. What a sweet and creative little boy! Be glad it's a fly he want for a pet it could be a snake or a bat! 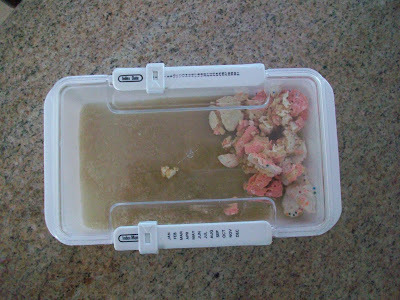 I know it's so unsanitary, but it's sooooo cute…. Oh that is the cutest thing ever and so something that my son would do. He too has a great love of pets and collecting them. That is soo so funny, I love this post!